We offer a full complement of Chinese Medicine services, including Chinese Herbal Medicine, Cupping, Gua Sha, Moxibustion and Acupuncture. Because Acupuncture is such a popular service we devoted a full page to it here. Meet with our expert Herbalist to find out how this ancient medicine can resolve your ailments and optimize your health and longevity. Includes a 40-minute consultation with our expert herbalist. Your herbalist will explain your Traditional Chinese Medical diagnosis after assessing you for your constitutional pattern of disharmonies. This process will include diagnosing you through the ancient art of tongue and pulse analysis. (Cost of any herbs or other supplements not included). Chinese Herbal Medicine is the world’s oldest and most comprehensive system of holistic remedies. Our complete Chinese herbal pharmacy consists of hundreds of herbs that are carefully inspected and selected for safety, quality, and optimal dosing according to the highest international standards. Chinese herbs have been thoroughly studied and researched by drug companies, who wish to extract their vital healing essence and develop drugs with these chemicals. However, when these drug company chemists isolate and concentrate just one chemical component of an herb, they risk creating something poisonous to the body, and they lose all of the hundreds of synergistic phyto-nutrients that make up the total healing effect of any particular herb, let alone a formula involving many herbs. The ancient Chinese herbalist always sought to balance the herbs against each other so that the organs of the body would not be injured. At Healing House, our skilled herbalists know exactly how to create Chinese herbal formulas with your specific health needs in mind, and they know how to do it safely. We take full account of all drug interactions and know which herbs to give you and which to avoid, based on your existing drug regimen. What do your Chinese herbal formulas look like? They may come in the form of “tea pills,” which look like little black spheres, or as tablets, or as teas. Chinese herbs in pill form have the advantage of being quick and easy to take. They are convenient for travel, and they have no strong smell or flavor. Although our herbalists have literally hundreds of pre-bottled herbal pills to choose from, the pill form of Chinese herbs lacks the customization possible with making a tea from granules or raw herbs. Granules are especially easy to prepare – you simply empty a packet of dissolvable herbs into a hot cup of water, stir, and drink. This allows for customization and convenience, although the flavor of the teas can be a little hard for Western palates to get used to. We can also create raw herbal formulas, which require you to cook the herbs in their natural root, leaf, twig, or flower form. But preparing the herbs this way can take a long time, and the smells and flavors produced can be quiet earthy and bitter. Your herbalist will discuss your options with you and come up with a solution that works best for your health and lifestyle. Chinese herbal medicine is effective for a very wide range of ailments, but they are most commonly used for fertility, regulating menstrual cycles, symptoms of menopause, insomnia, digestive issues, kidney and gallbladder stones, liver detoxification, strengthening the immune system, dealing with colds and coughs, arthritis, and chronic fatigue. They are also good for maintaining general health and longevity. Chinese herbal medicine is not a replacement for good nutrition, exercise, sleep, and meditation, nor do we recommend you stop taking your medications without consulting your doctor first. However, if you want to heal your body in a natural way, consider Chinese herbal medicine. The results can be truly spectacular, and they are generally a far safer alternative to dangerous drugs or surgeries. Cupping is special therapy developed back in the days of ancient China that involves the use of suction cups applied to the skin – especially to the back, neck, and shoulders. The cups create a microstretch by pulling the muscles up and holding them there for 15 to 20 minutes. The force of the suction draws stuck blood and toxins out of the lymph and brings it up to the surface of the skin, where the body can better dispose of it. “Gua Sha” refers to a gentle scraping of the skin with an smooth porcelain or ceramic tool. Gua Sha breaks up scar tissue and knots in the fascia and stimulates the muscles the let go. This combo session requires a 60-minute appointment. If you make this your first appointment at Healing House, please come to your appointment 15-minutes early to fill out paperwork, or just print it out and bring it with you. After the 2016 Olympics in Brazil, there was a lot of buzz created by the strange, circular marks on some of the top competitors, such as swimmer Michael Phelps and gymnast Alex Naddour. These athletes swore by the healing effects of a therapy called “cupping,” a technique utilized by acupuncturists to release and relax their muscles. Cupping uses suction cups to create a microstretch in the muscles and draw stuck blood up to the surface of the body, which creates those giant purple hickies. It’s wonderfully relaxing and rejuvenating for our patients, and we recommend it especially for patients with sore or tight muscles. Most people keep their tension in their neck and shoulders, whether it comes from sports and working out, or from sitting at a computer all day, or from carrying around small children. Cupping helps to pull those muscles out of their locked in position. It’s just as effective for the treatment of low back pain, and it can also be used to help release tension in the pectorals, glutes, and deltoids. The strange round bruises that are sometimes left over from the treatment are not painful, and they usually fade away within a week or two. Gua Sha is a traditional Chinese scraping technique, but that makes it sound a lot worse than it actually is. In fact, it’s one of the most relaxing and most requested of the therapies we offer. Your acupuncturist will first apply specially formulated oils to your neck and shoulder region, and then use a traditional Chinese soup spoon – the same big, white spoon you eat your egg drop soup with – to rub and release your muscles. Typically, this will create a reddish rash on your skin. This is not really a sign of skin irritation; it’s a result of old capillaries and stuck blood being broken apart. This micro-injury stimulates the body to get to work healing the muscles and restoring blood flow to the area. It moves the lymph and can be very detoxifying. Most of our patients feel a little dizzy afterwards. Let’s walk you through your Cupping and Gua Sha Combo session. You will first meet with your acupuncturist, who will have some general questions for you and address any health concerns or considerations before beginning treatment. For both cupping and gua sha, the patient will typically lie prone on their stomach. Their neck, shoulders, and low back will need to be exposed for optimal treatment. The acupuncturist will then apply a special blend of Chinese oils that have a warm, minty fragrance. They will start with gua sha to break up stagnation in the muscles and the “fascia” (a layer of tissue between the skin and muscles where toxins tend to accumulate). You will be asked throughout your session if the pressure is okay, and you will be reminded that the you are in complete control of the treatment. This is not a “more pain, more gain” situation – we want you feeling relaxed and happy. Gua sha is only applied over the rib cage – we do not do gua sha over the low back, as it can cause those more sensitive muscles to seize up in response to the pressure. A little gua sha goes a long way – we usually only scrape for about 5 minutes. Your acupuncturist will then apply cups to your neck, shoulders, back, and lumbar area, paying special attention to your trouble spots. The cups feel strange and a bit pinchy, but are not painful. They will stay in place for about 10 to 15 minutes. Once they are removed, you’ll feel an instant sense of relaxation and stress relief that can last for several days. Moxibustion is a powerful therapy in which a Chinese herb called Artemisia Vulgaris (a.k.a., “mugwort” or “moxa”), is lit as a cigar and held carefully near acupuncture points on the skin to warm and tonify the Qi. This treatment is used to increase energy, improve immune function, and support fertility. It is especially well known for its proven ability to turn a breech baby in utero. This treatment is performed seated on our patio, and therefore availability is subject to weather conditions. If you make this your first appointment at Healing House, please arrive 15-minutes early to fill out paperwork. Because moxibustion produces a thick, heady smoke that smells rather similar to marijuana, we don’t offer the treatment within the walls of our clinic. Instead, we usually take the patient to a comfortable outdoor seating area. Because of this necessary arrangement, this combination is only available as weather and season permit. Typically, the patient sits at ease on a chair, and the needles are gently and painlessly inserted into areas on their head, ears, arms, wrists, hands, legs, ankles. and feet. 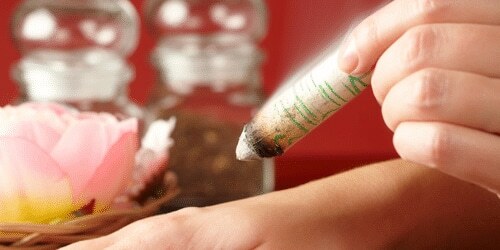 Moxibustion is then applied by the acupuncturist, who will use a lit “moxa cigar” and hold it near to the needle. The acupuncturist always keeps their own hands between the patient’s skin and the cigar so that heat can be gaged properly. We don’t need a patient to feel the heat too intensely – a gentle warming sensation suffices. Moxa is applied for about 20-minutes total, and then the needles are left in place for another 20-minutes. When you add up the time it takes to consult with the patient, insert and remove the needles, and apply the moxa cigar, the entire session takes about an hour. Moxibustion is best suited to patients who are suffering with chronic fatigue, indigestion, poor circulation in their legs and feet, cold sensations in the body, neuropathy, and infertility. Moxa is famous and well-researched for its ability to move a breech baby to its proper head-down position in the womb. During your Moxibustion session, your acupuncturist will be teach you how to apply your moxa cigar to acupuncture points on your own body, and at the end of your session, your moxa cigar will be gifted to you for your personal use at home. Each time you come, your acupuncturist will teach you more locations and techniques. In this way, you can really take full advantage of the healing power of moxibustion. I went w/bad right shoulder. It has been hurting for about a year now. I was a little worried about seeing this type of Dr. It was a great experience and my shoulder has been nice since I left his office. It has been 2 days and it feels normal. Thank you! Save 34% Off Chinese Medicine at Healing House! What Happens After Your Chinese Medicine New Patient Special?